If you're looking for a quick and easy way to chill out, we would simply suggest that you stop reading this, and that you step outside with a wet t-shirt and wide-open arms. If you have no desire to willfully induce pneumonia however, we would suggest you keep your arms wide-open, and instead embrace the work of San Franciscan artist and producer Scott Hansen aka Tycho. His album 'Dive', released by perpetually impressive label Ghostly International at the end of last year, is a crystal-clear stream of hazy pulses within a vast audio landscape, anchored by dreamy guitar and drum loopings; all masterfully informed by the connotations of the album's title. Following the record's release, and the success of his XOYO date last year, he's set to return to the UK with a date at Cargo on 25th Feb! '25th of February?? But that's days away!' we imagine hearing you say. 'Chill', we say. He's put together a mix you can listen to below in the meantime. Dazed Digital: In your opinion, how is 'Dive' best served - chilled or hot? 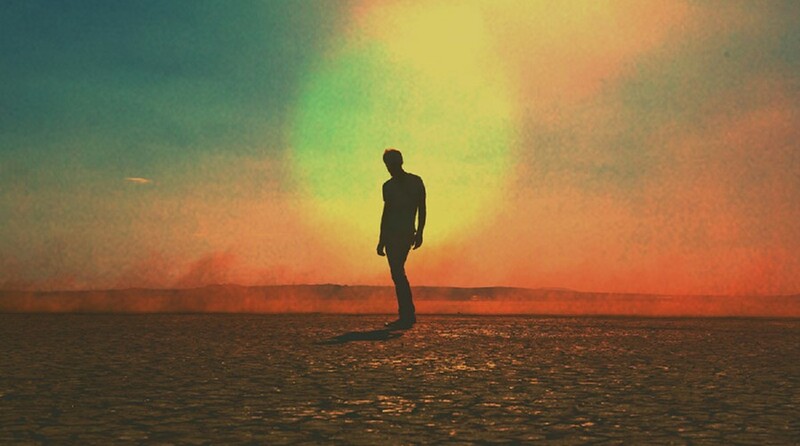 Tycho: I don't typically associate ideas or emotions with temperature, but I suppose I do see the album as occupying a sort of a bluish space with some orange hues here and there. So perhaps it's a more chill record; although for me, there are some "hotter", more energetic points. DD: Do you consider yourself to primarily be a musician and a visual artist second? Or does it depend on the day you're asked? Tycho: I don't see any real separation between the two mediums; I'm trying to express the same ideas with both. I think there are some things I am unable to fully express with my visual work and the music is what fills that void. At the same time, I don't think you can fully appreciate the music without the anchor of the visual work. DD: How are your designs being incorporated into the live show? Tycho: I've taken a lot of my poster art and photography and animated them, combining them with effected film footage. I've tried to take the aesthetic of the poster art and apply that to motion. DD: Have you been working with any other artists - musical or otherwise - on any upcoming projects? Tycho: I have been working with Zac Brown, the bassist for the live shows, on new material for the upcoming stuff. We started working together in a live context years ago but he ended up coming in and adding some of the guitar and bass work on Dive and we'll be working more closely on the next album. DD: Your live show comes to London on the 25th. Are there any particular places you like to visit whilst you're here? Tycho: I really enjoy the cuisine around Brick Lane and there's nothing quite like having a pint in a London pub. DD: What is your favourite sound? Tycho: Rain in a redwood forest on the Northwest Coast. Tame Impala - Why Won't You Make Up Your Mind?